Seventy-five years ago, John Miniclier and Edgar Fox were young men serving their country on one of the most remote military outposts in the world. They did not imagine that the events unfolding around them would bring them back to the sandy beaches of Midway three-quarters of a century later to commemorate one of the greatest battles of history – a victory that helped turn the tide of World War II. 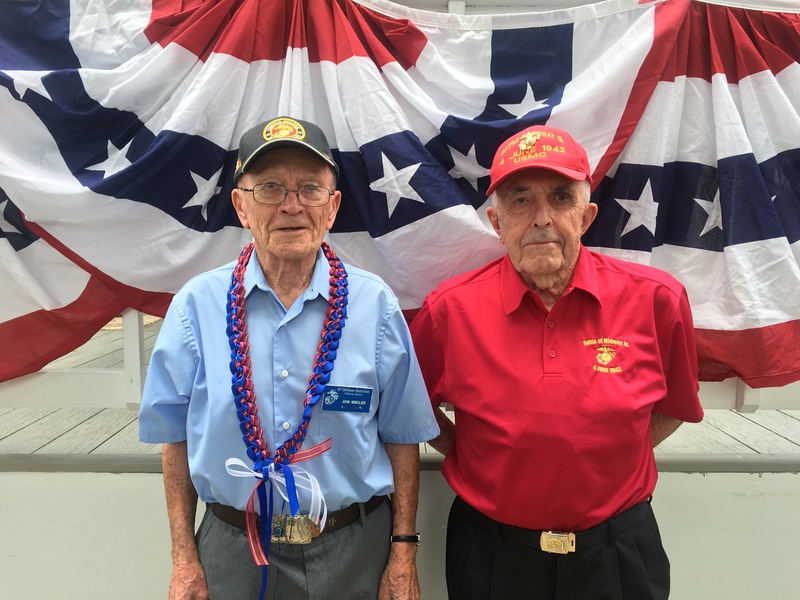 This time around, their imaginations didn’t have to stretch quite so far – both Veterans attended 70th Anniversary events on Midway in 2012. Despite the advance of years, there has been no diminution in the requests for their “celebrity” appearances or in their graciousness in filling them. 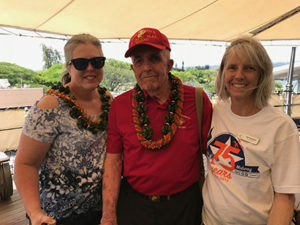 Colonel Miniclier and his daughter Peggy Miniclier flew to Hawaiʻi from Florida, while Sergeant Fox and his daughter Debbie Fox traveled from Missouri. 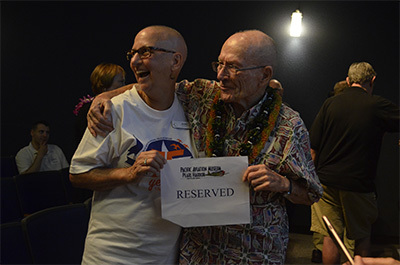 They were honored during the Battle of Midway Symposium at the Pacific Aviation Museum, where historians Craig Symonds, Jonathan Marshall and Daniel Martinez gave engaging presentations about the people and context of the great battle. The Veterans also had time to visit other historical sites in Pearl Harbor, including the Battleship Missouri Memorial and Station HYPO, the U.S. Navyʻs cryptographic intelligence unit in Hawaiʻi during World War II. The Veterans and their daughters will be on Midway to participate in the Midway Atoll Livestream event, scheduled for June 5, 2017, 10:30am, PST. Tune in to the Livestream here: Battle of Midway Livestream. U.S. Navy Memorial – Washington, D.C.
Friends of Midway Atoll (FOMA) has been actively engaged in the commemorations. Board members attended events in Honolulu at the Pacific Aviation Museum, and will be present at commemorations at the WWII Valor in the Pacific, on Midway Atoll NWR, and at the U.S. Navy Memorial in Washington, D.C. FOMA also helped ensure comfortable travel arrangements for Colonel Miniclier and Sergeant Fox and is providing gift bags with commemorative T-shirts and other Midway memorabilia to WW II veterans at several events. If you know of other Battle of Midway Veterans, weʻd love to make contact with them. We invite you to take a few moments over the next several days to learn more about this historic battle, the men whose insight, intelligence and courage helped turned the course of a war, and about Midway Atoll National Wildlife Refuge and Battle of Midway National Memorial, which continues to preserve, protect and restore the historic and natural resources that make Midway a place like no other. For more information about the Battle of Midway, including videos and images, visit the U.S. 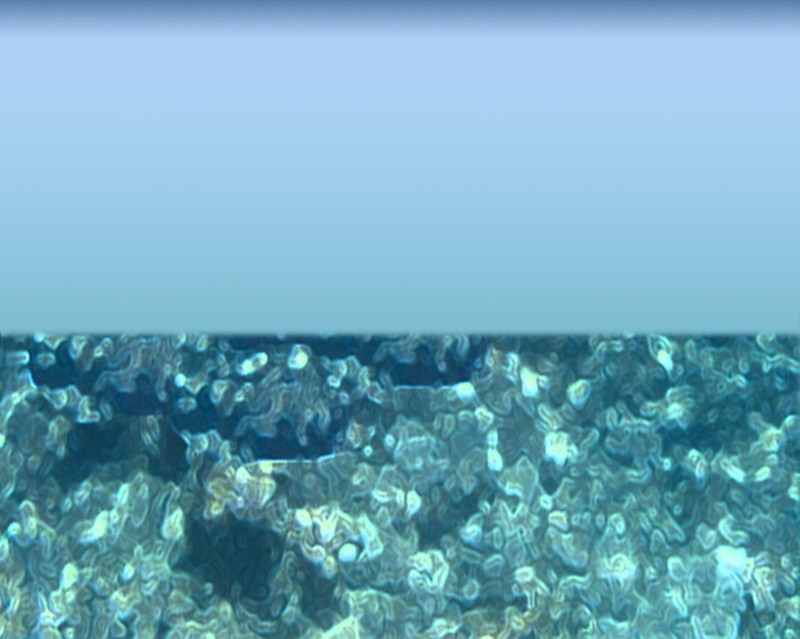 Fish & Wildlife Serviceʻs excellent website: 75th Battle of Midway Commemoration.